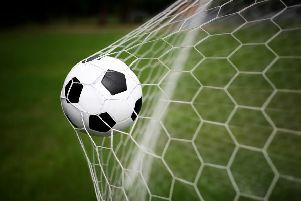 Bexhill United Football Club eventually got over the line to beat an AFC Varndeanians side which had three players sent-off at The Polegrove on Saturday. Kevin Barden’s late winner gave the Pirates a 2-1 success at home to opposition which ended the Macron Store Southern Combination League Division One match with eight men. Bexhill manager Ryan Light admitted the pitch was firmer than he thought it would be on the southern side and Varndeanians seemed to have a few concerns, but the referee was happy for the game to go ahead. Bexhill dominated the ball in the early stages, but Varndeanians counter-attacked very well and were probably fashioning as many opportunities as Bexhill. Bexhill drew first blood around the 25-minute mark. Craig Ottley sent over a superbly delivered corner which beat all of the Varndeanians defenders and Lewis McGuigan rose high to power a header into the roof of the net from two yards. Varndeanians had a golden opportunity to level things up when they were awarded a penalty after McGuigan put his hands on the back of an opponent as they jumped for a ball on the edge of the box. But the visitors put the spot-kick wide, handing Bexhill a reprieve. Varndeanians did equalise shortly before half time. Bexhill felt they ought to have been awarded a free kick for a tug on McGuigan’s shirt, but the referee instead gave Varndeanians a throw, following which the ball was crossed to the far post and Matt Waterman scored with a looping header. Bexhill made a fantastic start to the second period and Varndeanians were camped in their own half. Bexhill started to create chances and although the ball kept going past the post, it seemed only a matter of time. With Bexhill on top, Varndeanians started voicing their concerns about the condition of the pitch more vociferously. One of their players picked up two yellow cards in a matter of minutes, firstly for clashing with Zack McEniry and then for diving in to a tackle. While he was being sent-off, the Varndeanians captain was shown a straight red card, presumably for something he said to the referee. Varndeanians then set up camp in and around their own penalty area, and looked more solid with nine men than 11. Bexhill were struggling to keep hold of the ball as the pitch firmed up. The visitors went down to eight men when one of their players for a comment to the linesman. Bexhill kept throwing bodies forward and their persistence eventually paid off with an 88th minute winner. A well-delivered Wayne Giles corner to the near post led to a bit of a scramble and Barden forced the ball over the line for his first league goal since the opening game. Bexhill: Rose; Cornelius, McGuigan, McFarlane, Ottley (Giles); Beale (Harffey), Cuddington, Lopez; Gouet (Barden), Wheeler, McEniry. Southern Combination League Division One top half (played-points): 1 LITTLE COMMON 19-49 (+45 goal difference), 2 Lingfield 19-41 (+34), 3 Langney Wanderers 18-41 (+33), 4 Wick 19-40 (+32), 5 BEXHILL UNITED 19-34 (+21), 6 Selsey 17-29 (+11), 7 Mile Oak 18-29 (+3), 8 Steyning Town 18-28 (+17), 9 Ringmer 19-27 (+10).